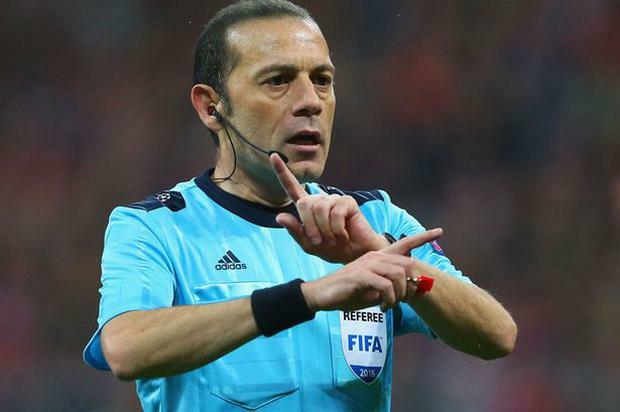 Turkish referee Cuneyt Cakir will take charge of England's World Cup semi-final against Croatia on Wednesday. The 41-year-old officiated Barcelona's 2015 Champions League final 3-1 win over Juventus and oversaw the Holland versus Argentina last-four clash in Brazil four years ago. Cakir also refereed Alex Ferguson's last match in the Champions League in 2013, provoking the Scot's anger after sending off Nani for a high tackle in the last-16 defeat to Real Madrid. Ferguson, who opted not to attend his mandatory post-match press conference, said it was "hard to keep faith" after the decision. Prior to the match he had told his backroom staff he was concerned Cakir had a tendency to send off players of English-based teams having dismissed seven but never any from teams playing against them. Those players Cakir red-carded included Chelsea's John Terry, Gary Cahill and Steven Gerrard. The three red cards shown by Cakir to England players all came in 2012. The first caused Terry to miss Chelsea’s Champions League final, although the club’s then captain only had himself to blame after inexplicably driving a knee into Alexis Sanchez in the second leg of their epic semi-final win over Barcelona. Cakir then dismissed Gerrard for the first time in his England career in a World Cup qualifier against Ukraine, showing the captain two yellow cards. The referee showed Cahill a straight red card in Chelsea’s Club World Cup final defeat to Corinthians after the defender kicked out at Emerson in the final minute of the game. Cakir has been involved in controversy at this World Cup - Nigeria felt they should have had a penalty in their 2-1 defeat to Argentina, with the incident not reviewed by officials.